School and districtwide subscribers can set up LTI 1.0 integrations in their Learning Management System (LMS). Any LMS that supports LTI tools can use the integration, which provides single sign-on (SSO), My BrainPOP account provisioning, and the embedding of BrainPOP topics into course materials for your teachers and students. 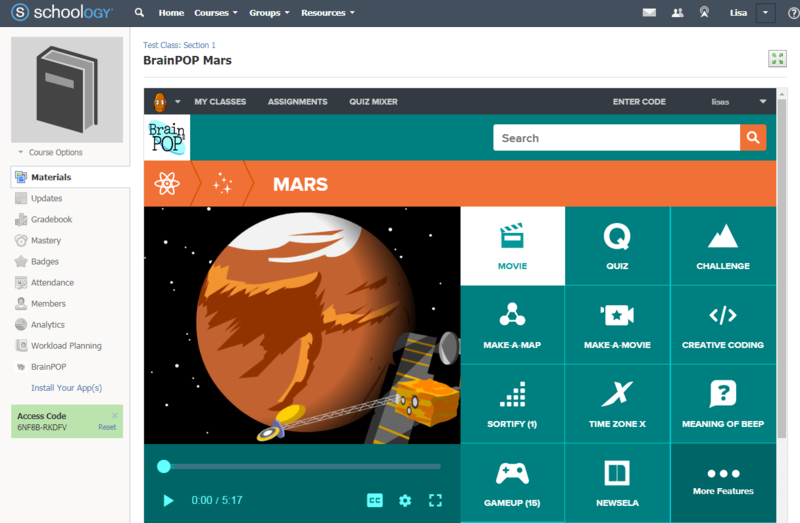 The tool can be configured to launch SSO to the BrainPOP homepage, or it can launch to a topic selector which allows teachers to add specific topics to course materials. You can set up the tool on the school or the district level. LMS administrators should contact us for the key and secret for their school or district. Once an LMS administrator sets up the tool, teachers and students can use the LTI Integration with BrainPOP Step Guide to help them create their My BrainPOP accounts the first time they log in via the tool. The LTI tool in Canvas provides single sign-on and My BrainPOP account provisioning. You can embed the tool in an Assignment or a Module within a Canvas course. You can find the BrainPOP LTI app in the Eduappcenter. You’ll need the school or district key and secret depending on whether you are installing the tool on the school or district level. Contact us for the key and secret. Once you have the configuration URL from the Eduappcenter and the key and secret from us, you can install the external tool. Follow the Canvas LTI Tool Set Up Step Guide for setup instructions and first-time user instructions for teachers and students. The Canvas app also includes a Rich Text Editor and/or course navigation link to our Canvas LTI integration. Note: Canvas administrators who have set up LTI integration before February 2018 should revisit the Eduappcenter and use the updated configuration URL in order to access the Rich Text Editor and course navigation links. You can use the Rich Text Editor to select and embed BrainPOP topic LTI links directly into your Canvas assignments, rather than selecting the external tool submission type below the editor. There is also a link along the left, which will provide single sign-on to the BrainPOP homepage. Clicking the Rich Text Editor will bring up a modal with our topic selector. Selecting a topic will embed a link into your assignment. After publishing, the link will provide SSO directly to the selected topic. The LTI tool in Schoology provides single sign-on and My BrainPOP account provisioning. 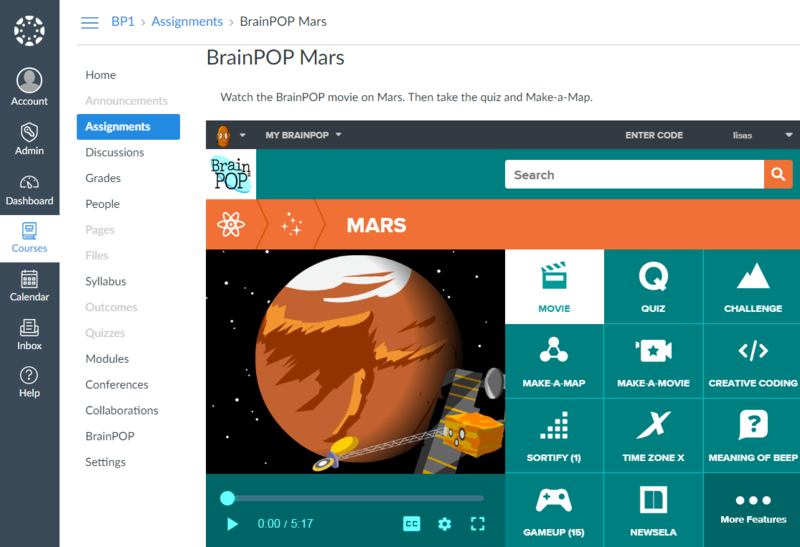 The tool provides a BrainPOP topic selector for teachers, allowing teachers to choose topics for students, and for students to log in directly to topics assigned by teachers. 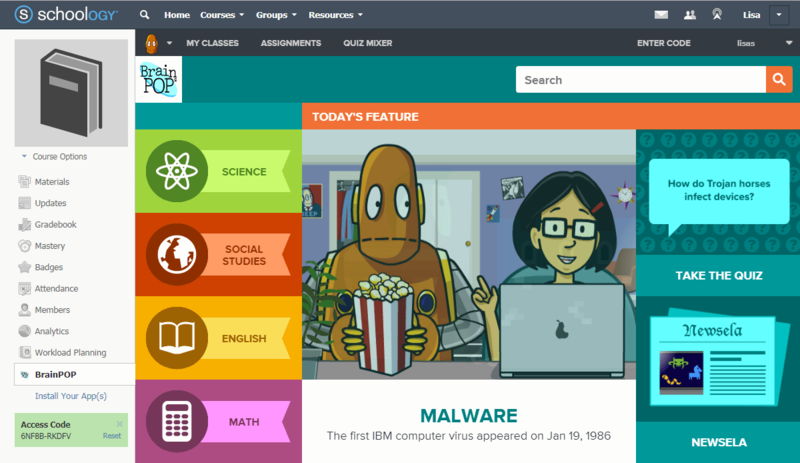 The app also provides a single sign-on link to the BrainPOP homepage in your course navigation. You can find the BrainPOP LTI app in the Schoology App Center. You’ll need your school or district key and secret depending on whether you intend to install the tool on the school or district level. Contact us for the key and secret. With this information, you’re ready to set up the external tool. Follow the Schoology LTI Setup Step Guide for setup instructions. Follow the LTI Integration with BrainPOP Step Guide for first-time user instructions for teachers and students. ClassLink Launchpad supports the BrainPOP LTI integration offering single sign-on and My BrainPOP account provisioning for school and district subscribers. If you also use OneRoster API, teachers can import their OneRoster classes into My BrainPOP as well. Contact us to get set up with ClassLink Launchpad and OneRoster. Any LMS that supports LTI 1.0 should support the BrainPOP LTI tool. Contact us for your school or district level key and secret.You will also need the host URL for the BrainPOP or BrainPOP Jr. LTI tool. To set up the tool to launch a topic selector, use the host URLs above. Removing “tool=yes” sets the integration up to provide SSO to the main BrainPOP or BrainPOP Jr. homepage. Note: We recommend sharing names and teacher email addresses with this tool, and setting activities to launch in a separate tab (rather than embedding on the page). Follow the LTI Integration with BrainPOP Step Guide for first-time user instructions for teachers and students. We already have an SSO integration set up with G Suite. Can we set up an LMS integration, too? For ease of use, we recommend you choose either G Suite or an LMS integration to use for your school or district. Subscribers who are initially set up with one SSO and attempt to access via another may result in the creation of duplicate accounts. There are teachers and students in my school/district already using My BrainPOP. When I set up the integration, can they continue using their existing My BrainPOP accounts, or do they need to create new ones via the LMS? When teachers and students who already have My BrainPOP accounts use the LTI app for the first time, they will be prompted to match their existing My BrainPOP accounts to their LMS identities. They will not need to create new accounts, and they will not lose any of their classes, assignments, or submissions.